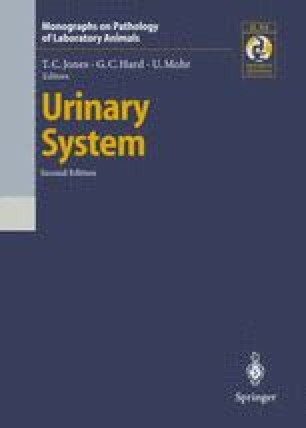 Undifferentiated carcinoma of the urinary bladder has been reported in five studies (Fukushima et al. 1976; Kunze and Schauer 1977; Goodman et al. 1979; NIH 1979; Deerberg et al. 1985), although specifics regarding its gross appearance were not given. Since this neoplasm is generally more invasive than other bladder neoplasms, it is more likely to present as a solid mass infiltrating the bladder wall rather than a papillary or plaque-like lesion limited to the mucosa. All six of the cases reported by Deerberg et al. (1985) had metastases to the lung or lymph nodes; no metastasis was observed in the other studies.